Looking for fun and funky jewelry ideas that will make you the life of the party? Try your hand at the Embossed Burlap Necklace from Candace Jedrowicz! 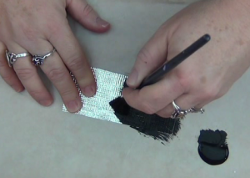 The key to this project is soft embossing pewter which is used to make the beads. 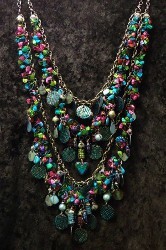 This necklace is so chic and adorable! 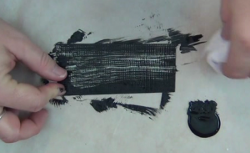 Cut a piece of embossing pewter and a piece of burlap, twice the size of the pewter. 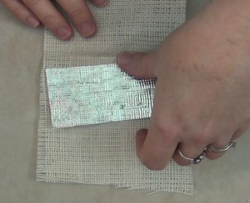 Sandwich the pewter in the burlap and run through a die cut machine, or use a rolling pin to firmly press the burlap into the metal. Paint one side of the pewter. 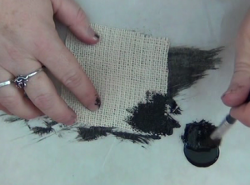 Wipe the paint off with a dry paper towel to create an antiqued finish. Repeat on the other side. Allow to dry. 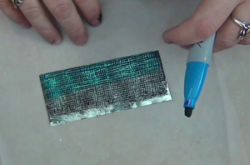 Color the metal with your permanent marker, being careful to use one-way strokes. Going back and forth will pull up the paint. Punch out small shapes. Punch holes for stringing. 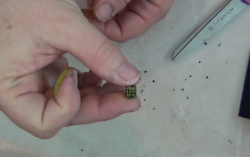 Coat each bead with dimensional sealer on both sides. 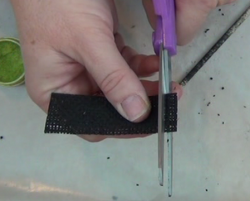 Cut a small piece of burlap 1″ wide. Paint and allow to dry. 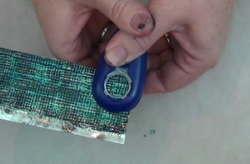 Cut 1/4″ strips to make beads. Roll each strip around a skewer. Unwrap the end and put a dab of Aleene’s Original Tacky Glue on the end and re-wrap firmly as you twist the bead off of the skewer. Allow to dry. 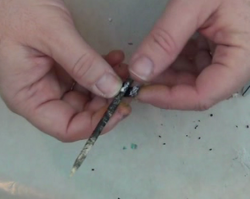 Dip your finger or a Q-tip into the metallic powder and rub gently onto surface of the bead. Using too much or rubbing too hard will push the powder into the recesses and you won’t be able to see the burlap texture. I used a ribbon with holes so I could weave the silk cord through. That allowed me to bunch up the ribbon for a full look. Attach the burlap and pewter beads with 20 gauge wire. Add accent beads. Attach additional chains at different lengths. 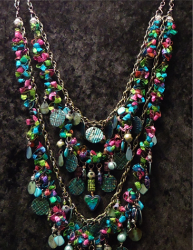 Both ribbons and decorated chains can be attached to chains with a clasp. 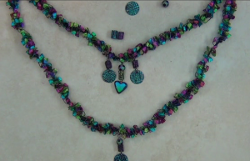 For a comprehensive video tutorial of this project, check out How to Make a Burlap Embossed Necklace and Beads.